The Bernie Sanders presidential campaign, contrary to all expectation, has become the most important left insurgency in the United States in nearly half a century. A year ago, even his most optimistic supporters might have hoped that Sanders would enliven the presidential debates by challenging Hillary Clinton on issues of Wall Street power and big money corruption, and perhaps garner a quarter to a third of the primary vote. Instead, Sanders won primaries and caucuses in 23 states, and amassed over 12 million votes and nearly 43% of the pledged delegates. And all this while unapologetically and unabashedly proclaiming himself a “democratic socialist,” re-legitimizing a systemic critique of US capitalism for the first time since the one-two punch of Cold War reaction and neoliberal triumphalism froze the left out of mainstream American discourse two generations ago. The power of Big Banks, job-killing trade deals, ending the corrosive influence of big money in elections, eliminating private insurance companies from the health care system, and the merits of a “political revolution” became staples of prime-time presidential debates. Once stunning poll numbers now seem commonplace: 43% of Iowa caucus goers, including roughly a third of Clinton supporters, describing themselves as “socialists”; a New York Times poll late last year which said that 56% of Democratic primary voters had a “positive view of socialism;” and Sanders’ overwhelming support among young voters, by margins as high as 84% in Iowa and New Hampshire, but even reaching the low 60s in states like South Carolina, where he was otherwise crushed. Indeed, Sanders’ remarkable popularity among “millennials” prompted John Della Volpe, the director of a long-running Harvard University poll of young people, to tell the Washington Post that Sanders is “not moving a party to the left. He’s moving…the largest generation in the history of America…to the left.” Something significant is definitely going on. A new national left party or a single unified organization is unlikely to emerge from the Sanders movement, but let’s build something. The Occupy encampments changed the global political discourse, but the movement’s longer-term potential was squandered by its rejection of organization-building, an anti-leadership obsession with “horizontality,” and an aversion to program. Preoccupation with “holding space” and with decentralized direct action made it impossible to create the Occupy equivalent of SNCC or SDS—an organization that could have carried forward the anti-Wall Street mobilization even after state violence dismantled the encampments. We shouldn’t make those mistakes again. The question of race must be dealt with upfront. In order to gain credibility among constituencies of color which were reluctant to back Sanders, the new formation must unify the agendas of the Occupy, Black Lives and immigration rights movements. It must prominently engage key community and political leaders of color like Representatives Keith Ellison and Raul Grijalva, Ohio State Senator Nina Turner, and NYC Councilmember Jumaane Williams (who led the legislative fight against “stop and frisk”), former NAACP leader Ben Jealous, and intellectuals like Michelle Alexander, who is probably the most significant intellectual influence on millennial activists, both white and black. And from the start, the post-Sanders formation must take up issues that are immediately relevant to constituencies of color—police accountability, stopping the attack on Voting Rights, or comprehensive immigration reform, to suggest just a few examples. The new movement should mobilize around a limited agenda that takes on issues of economic and racial exploitation on the one hand, and the reclamation of our democracy on the other. Such an agenda should be clearly understood as an effort to hold the new President and elected Democrats at every level accountable to the yearnings of tens of millions of Americans for racial and economic justice. This issue mobilization must begin—starting at the Democratic National Convention—by uniting forces both inside and outside the Sanders campaign to kill the Trans-Pacific Partnership trade agreement (TPP) once and for all. This is not only the right policy, but critically important for the electoral success of the Democratic Party. So called “free trade” embodies the deep contradiction between the neoliberal bankers and technocrats, on the one side, who have dominated Democratic Party economic policy-making since the Clinton Administration, and its traditional working class base, on the other. It is also now the Party’s most vulnerable Achilles heel with white working class voters, whose sense of betrayal and economic hopelessness drive Trump’s right-wing, nationalistic populism and reduce Clinton’s support among these voters to abysmally low levels. Sanders has already pushed Clinton to rhetorical opposition to the TPP; in the run up to the convention, Sanders and Clinton should work together to extract a promise from Obama that the treaty will not be taken up in the lame duck session. In 2009, rather than mount mass mobilizations that would have invested Obama’s “hope and change” with real progressive content, labor substituted visits to the White House for street heat. The test of the post-Sanders movement will come in 2017, when it will face the challenge of pushing Clinton to the left and charting a new political agenda for the Democratic Party. It is not hard to imagine a short list of issues around which a new left could organize. A national campaign for a Wall Street Speculation Tax to fund free public higher education or investment in tens of millions of infrastructure jobs would extend the challenge to Wall Street power that lies at the heart of Sanders’ narrative. Communities of color could be galvanized by a national campaign to restore Article 5 of the Voting Rights Act, echoing and broadening Sanders’ demand for a renewed political democracy. And at the local level, let’s mount state-based campaigns for the public financing of elections of District Attorneys—the elected officials who are at the heart of the pitched debate about the unfairness of the criminal justice system. Such a campaign might have huge appeal to grassroots movements like Black Lives Matter. The details of the issue agenda should be vigorously debated, and I claim no monopoly on the correct answer. What is critical is trying to bring together the organizations and constituencies which supported Sanders, along with those who didn’t but also seek a leftward shift in the American political discourse, around a limited set of campaigns that can build on the gains of 2016. By going on the offensive—and thereby defusing a likely Right-Wing counteroffensive to set the terms of debate in 2017—a broad progressive formation can redefine the national agenda around issues of race and class inequity and inaugurate a new era of progressive reform. Launch a massive program of grassroots political and economic education. In the waning decades of the 19th century, the Populist movement deployed a small army of “lecturers” who traveled across the Plains talking to farmers about issues of debt, credit, monetary policy and the power of Wall Street over their lives. This popular education helped build the mass base for a reform agenda that ultimately culminated in the sweeping changes of the New Deal. Our movement requires a similar commitment to mass popular education. An openly socialist current should be built within the new movement. Senator Sanders’ refusal to retreat from his identification with democratic socialism certainly ranks as one of the most remarkable features of the campaign. To those of us who can remember “Commie” as a schoolyard epithet and “duck and cover” air raid drills, let alone labor’s bitter internecine battles over U.S. imperial misadventures in Vietnam and Central America, Sanders’ open embrace of socialism and the absence of “red-baiting” in the campaign has been almost beyond imagination. The grassroots organization which appears to have experienced the greatest membership growth as a direct result of the Sanders campaign has been the Democratic Socialists of America, which traces its roots to the breakup of the old Socialist Party in the 1950s and is the largest remaining socialist organization in the country. In his account of the decline of American resistance to organized wealth and power in the “second Gilded Age,” The Age of Acquiescence, Steve Fraser argues that “the capacity to envision something generically new, however improbable, has always supplied the intellectual, emotional and political energy that made an advance in civilized life, no matter how truncated, possible.” In this telling, the reforms of the New Deal were driven by the utopian dreams of millions of Americans who believed capitalism must be transcended, and would have been impossible absent the presence of a “multi-faceted and long-lived culture of resistance that was not afraid to venture onto new terrain, to question the given.” In this new moment, while progressive unions and their allies fight for a “21st Century Glass-Steagall Act,” socialists would demand nationalization of banks. While more mainstream progressives call for a Wall Street Sales Tax, socialists might demand a maximum wage or a wealth tax. More mainstream activists will demand debt-free college education, while socialists would demand free tuition and free mass transit. Whether socialism exists today as a practical alternative form of social organization, or simply as a compelling moral critique of a racialized, financialized capitalism that is leading us to climate disaster, the revival of the idea of socialism facilitates the imagination of radical alternatives to the status quo. For the resuscitation of that hope, we owe an enormous debt of gratitude to Bernie Sanders. The “political revolution” must be driven down to the level of school boards, city councils, county legislatures, state government, and Congress. The goal is not to take over the Democratic Party, but to build an infrastructure—an independent political party—comprised of activists and elected officials, both inside and outside the Democratic Party, which can carry the agenda of the Sanders campaign forward. For the last two decades, the Working Families Party, now operating in 11 states, has worked to build the political capacity to challenge corporate, right-wing Democrats, and to help defeat right-wing Republicans in general elections. Operating as a coalition of unions, community organizations and independent progressives, a model which can leverage substantial resources, the Working Families Party has had its greatest success at the state and local level. The Party’s endorsement of Sanders was its first such national endorsement, and created some tension with several of its labor affiliates, most of which had endorsed Clinton. Nevertheless, the WFP’s political and ideological agenda is tightly aligned with that of Sanders; in a sense, Sanders is the national candidate who embodies the Party’s foundational aspirations. Thank you for a wonderful analysis. As a national delegate for Bernie and a high school government and economics teacher at a public school in Duluth, Minnesota, I could easily see myself being a part of the new left in the U.S. Many good ideas here. There are a huge amount of progressive groups in the country but most of them follow narrow agendas. Greens hardly talk to fight for $15 groups who hardly talk women’s rights groups, who hardly talk to labor, etc… There has to be a unifying structure so that progressives, while promoting their favored causes, can see themselves as part of a larger identity. At some point that coalition has to pursue political power – which means a new party (or a reconfigured Democratic)party. The Republicans are now self destructing. Hillary Democrats are taking their place as the party of wealth and privilege. A power vacuum on the Left has opened up (thanks to Bernie). We need to fill it. Labor, in large, did not move with the real chance for change. Offering resolutions now, and without the icon for change, Senator Bernie Sanders, for me is much too little too late. I suggest the union fat cats get on the phone to the Super Delegates now – then we could have a contest convention. The math is there! Then WHY DIDN’T LABOR LEADERS SUPPORT BERNIE LIKE HE’S SUPPORTED THEM FOR 50 YEARS? TPP – THE WHITE HOUSE GOES TO COURT TO BLOCK RELEASE OF HILLARY EMAILS UNTIL AFTER ELECTION – WHY DO YOU THINK OBAMA DID THAT? “Trade is a hot issue in the 2016 U.S. presidential campaign. But correspondence from Hillary Clinton and her top State Department aides about a controversial 12-nation trade deal will not be available for public review — at least not until after the election. The Obama administration abruptly blocked the release of Clinton’s State Department correspondence about the so-called Trans-Pacific Partnership (TPP), after first saying it expected to produce the emails this spring. Most of The unions endorsed Hillary. Obama doesn’t want them to see the truth of where she stands on it-and maybe his strategy to force it down our throats. He got the “fast track” approved for one reason: when congress recesses, he can just sign it into law. No further ratification necessary. Why did you complete a thorough analysis of the current political environment and ignore the existence of the Green Party!? I could guess that this is one more example of socialist vangardism shooting the “movement” in the head. A simple proposal to create the B.E.R.N. (Bernie’s Elected Representatives Network). Bernie should unilaterally establish a 15-person committee composed of representatives from what he thinks are his most important constituency groups (labor, black lives matter, 350.org, etc, etc.) The function of the committee would be to make decisions (maybe by a 2/3’s vote) on requests for endorsements from people who want to run for any public office on some variant of Bernie’s platform. Anyone getting the committee’s endorsement would get the contact and fund-raising lists, along with the right to claim the official Bernie endorsement. The logistics and finances need to be worked out, but should be doable. So the party that endorsed Andrew Cuomo is now giving advice on how to build the left. Very interesting. This is an excellent article in all but one significant respect. It suffers from the same deficiency as the Sanders Campaign – the failure to discuss foreign policy and military spending. 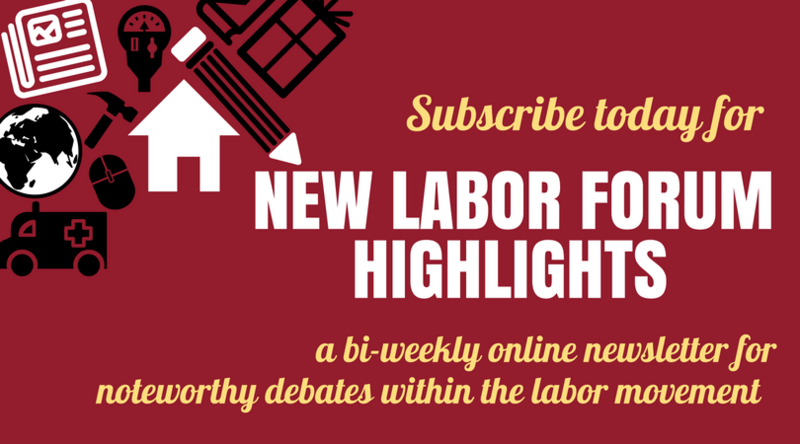 The labor movement has a foreign policy – whether we acknowledge that fact or not. If it does not have its own independent policy, by default its foreign policy becomes that of the U.S. government. In the past that also meant that AFL-CIO policy served as cover for State Department and CIA Cold War machinations, which in many instances were inimical to the interests of working people, both here and abroad. It made our labor movement an accomplice in the illegal overthrow of governments, military and political interventions in the affairs of foreign states, torture and assassinations and a host of other international crimes. In 2005, as a result of the organizing work of U.S. Labor Against the War (USLAW), the AFL-CIO broke with that history by officially opposing the U.S. military occupation of Iraq, putting the federation on record for rapid withdrawal of all U.S. forces. Subsequently the federation also opposed the continued military occupation of Afghanistan. In 2011, the Executive Council denounced our country’s “militarized foreign policy”. For the labor movement, foreign policy must involve more than just trade and immigration. Organized labor’s foreign policy should be rooted in the principle of international labor solidarity, not the interests of multinational capital. When the Sanders campaign began, and we organized Labor for Sanders, a number of us tried to get the Sanders Campaign to give greater attention to foreign policy and military spending. To the extent that Bernie did address foreign policy it was primarily to note that he opposed the invasion of Iraq and that Hillary Clinton did not. But that vote was in 2003 and much has transpired since. Bernie’s foreign policy positions have been a muddle – calling for Saudi Arabia to lead a Muslim nation coalition against ISIS and taking other positions that are at odds with a truly progressive position. To the extent he has spoken about the bloated Pentagon budget, it has been limited only to a discussion of waste, fraud and abuse – never challenging the underlying premise that drives military spending – U.S. hegemonic aspirations and the interests of multinational capital – or calling for a dramatic cut in military spending to fund domestic needs. No mention of the need to close most of the 1000 U.S. overseas military bases, cut rather than modernize our nuclear arsenal, terminate boondoggle programs like the F-35 joint strike fighter (which Sanders voted to support), or end U.S. efforts to militarily encircle Russia and escalate tensions with China. Any progressive alternative to the corporate-controlled duopoly that passes for political choices in this country must put forward an alternative foreign policy and alternative Pentagon budget. These challenges should have been and still need to be addressed in any discussion of the path forward for progressives committed to the Sanders campaign. Yet none of this appears in Brother Master’s otherwise excellent article. So BIG TIME OCCUPY WA, DC and defeat TPP and TAP, TIP other pacts from hell pumping out of the secret world order corporate gov of, by and for the mega corps. LABOR rights and every aspect of our lives depend on DEFEATING TPP stealing our legal sovereignty rights, freedoms and liberties. TPP is the USA gov selling our rights to mega multinationals tribunal courts. Call, write, march globally against TPP in unity with millions of citizens in the 12 Pacific nations in TRANS Pacific Partnership pact! Unite with all the global citizens being ripped-off and terrorized and threatened by TPP economic gangsters! Drag out all the tons of evidence of the horrors of NAFTA and GATT gross grim heinous crimes of MONSANTO monopoly monster madness mergers. I send all labor for BERNIE and People’s Summit in CHICAGO lots of forever love! We occupy every aspect of every issue and we are dreamers and schemers, walkers and talkers in our New Deal real progressive socialist platform of political revolution of democracy in action and we are rising rocking and dancing in the dragons jaws, in the bowels of the belly of the beast of Wall Street and massive RALLYS occupy the DNC Convention. unpopular US presidential candidates in history from the big fat ugly poison capitalists thugs tyrants traitors TREASONISTS of totalitarianism on steroids! We are in the midst of the most obscenely overpriced excessively corrupt rigged fixed casino PONZI schemes elections frauds by DEMS on full display! Golden advocacy for peaceful non-violent grass roots revolution reaching our NEWDEAL Yes! Precious progressive socialist action tools see largest gathering of advocates for civic MOBILIZATIONS without end as we exercise our unity for the Healing of the Soul of AMERICA.